(Orca Exploitation - Entertainment - 07) Bad education…. At marine parks, the subconscious message that children receive is that it is okay to exploit animals for profit. 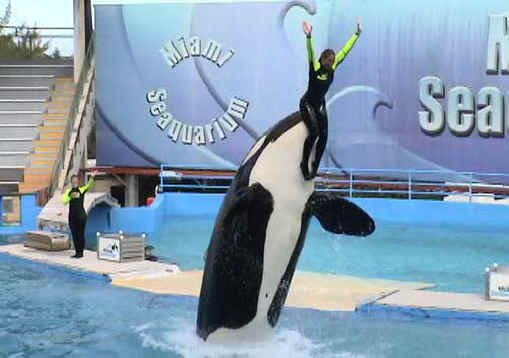 There is no educational benefit from watching an orca breach out of a tiny tank with a “trainer” on her nose. It’s a spectacle of dominance, much like the Roman Coliseum. We also believe that such spectacles harden the hearts of children from their natural feelings of compassion for all living beings. “Education at marine parks is like asking Walt Disney to teach us about mouse biology. It’s fantasy.” ~Ken Balcomb Marine Biologist Center for Whale Research.